(MENAFN - ForPressRelease) With the aim to strengthen the bilateral relationship, primarily through increased cooperation to reach the sustainability goals, Prime Minister of Norway Erna Solberg came to New Delhi for a three-day (7-9 January 2019) state visit to India. She was accompanied by senior officials from her government and a large business delegation. During the visit, she participated in the Indian-Norway Business summit that was held at The Oberoi Hotel, New Delhi on Monday 7th January 2019. Apart from attending various sessions at Indian-Norwegian solutions for sustainable growth, the honorable Norwegian Prime Minister, Erna Solberg paid floral tribute at Mahatma Gandhis memorial at Rajghat. Thereafter, the Prime Minister of India, Mr. Narendra Modi and Solberg held delegation-level talks and reviewed the entire gamut of bilateral ties. More than 100 Norwegian companies delegated to India as a part of India-Norway business summit 2019. The key points of discussion were Ship-building, Petroleum related services, Hydropower, Clean energy, IT market, etc. 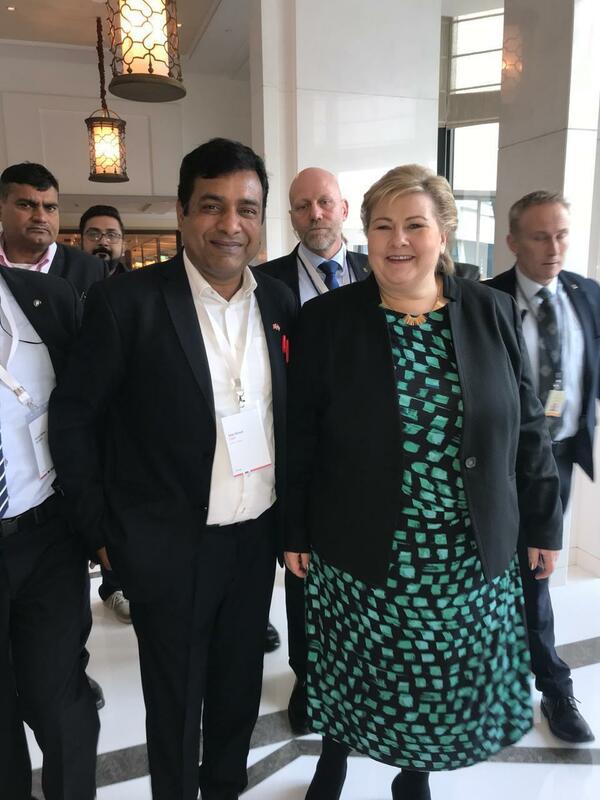 Major Indian companies such as Tech Mahindra, Tata Consultancy Services (TCS) and Endive Software were present there for the warm welcome of the Norway Prime Minister and the other delegates. The event commenced with the welcome speech by Ms. Inger Solberg, Vice President, Innovation Norway. Companies from maritime, seafood, marine, offshore, technology and defence industries came under one roof to actively contribute to the business summit. In the session of digital solutions, various major topics such as IoT (Internet of Things) in the energy space, Machine Learning, Digital Transformation, Energy & Health, Artificial Intelligence, and Blockchain were addressed by the top tech giants. These technologies are likely to open the door of opportunities and even make the lives of human beings even more comfortable. A presentation on the Indian IT market was given by Mr. C P Gurnani, Managing Director & CEO of Tech Mahindra. In his presentation, he discussed the future of IT market in India, areas of the digital market and benefits of IT. He described how IT industry has helped India in becoming economically stronger. Chief Economist of IKT-Norge, Mr. Roger Schjerva explained the Norwegian IT market. Norway is a great place in the world for technology companies both domestic and foreign-owned to locate and grow. He discussed the digital market in Norway and talked about the growth and various business models of IT. He further shared the facts and figures of internet users and business growth in the year 2017. 28% pay for advertising on the internet based on the web page content or keywords searched by users, 12% pay for advertising that is based on tracking internet users past activities or profile and 19% pay for advertising that is based on the geographical location of Internet users. 67% use social networks such as Facebook or Linkedin. 48% buy cloud computing services. Mr. Goran Karlsson, Executive Partner, TCS Norway, and Europe gave a presentation on the Digital Transformation. He discussed as to how Indian competence like Tata (TCS) can be important for Norway when embarking its digital transformation journey. Mr. Jens Alexander Aarvik, Regional Manager, DNV GL, Digital Solution discussed on how we can help the Indian industry to manage risk thru digital transformation. He further said, the digital revolution has made many changes for businesses and even whole industries. The next generation technologies are emerging dramatically to alter todays industries. Mr. Jens Middborg, Country Manager, Capgemini Norge AS and Mr. Pankajr Welankiwar, Delivery Executive From Capgemini proceeded the program by talking on How we safeguard security and safety when India and Norwegian competence works together to deliver digital solutions. He said that security and safety will increase vulnerabilities and capabilities of IT infrastructure and even enhance the digital solutions. Ms. Grete Coldevin, Chairman Smart grid area, Trondheim gave his views on the IoT (Internet of Things) in energy space. He said that IoT is playing an important role in the energy space as the energy space committee is using IoT to exchange, interact and connect information or data. There were more presentations given by prominent IT professionals during the program with the aim to bring in light the opportunities for Indian-Norwegian cooperation and digital solutions for a better future. Mr. Ajay Goyal, Founder, and CEO of Endive Software carried on one-to-one discussion with Mr. Rune Hogga (CEO of NODESmarket), Roger Schjerva (Chief Economist of IKT-Norge) and Alex Aarvik (Regional Manager of DNV GL- Digital Solutions). During the discussion, ideas and views about the technologies, security and IT infrastructure were exchanged. All in all, the Indian-Norway Business Summit was a fruitful event for both countries!